The Transonic Pro Heavy Duty Pest Repeller is ideal for squirrel control. 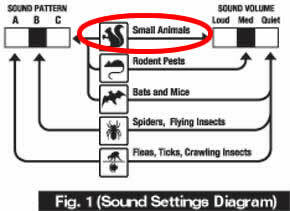 Select the Squirrel and Mice setting and plug it in. The ultrasonic sound environment is intolerable to Squirrels. Squirrels are repelled away from the Transonic Pro unit because they cannot adapt to the constantly changing array of ultrasonic and sonic signals emitted by this device. Covers up to 3,500 sq. ft.! -Squirrel control without traps or poisons! -Cost-effective. This unit will last for years. -Easy to use. Just plug it in. -Low power consumption - less then 5 watts! -Drives them away with sounds they can't stand! Independent laboratory and university testing has proven ultrasonic and sonic sound technologies to be effective forms of squirrel deterrents. This low-profile electronic squirrel repelleruses sonic (audible) and ultra-sonic (silent-to-humans) sound waves that Squirrels hate. The Transonic's intense, variable pitch sound waves effectively repels rodents. This noisy, hostile, dynamic sound environment is intolerable to Squirrels and other rodent pests, yet friendly to non-rodent pets, humans and the environment. Squirrels are repelled away from the Transonic Pro unit because they cannot adapt to the constantly changing array of ultrasonic and sonic signals emitted by this device. The unit disrupts their habitat, effecting their sleep and communication habits, forcing them to leave the area. No traps or poisons, the Transonic Pro Heavy Duty Repeller is a humane cost-effective, easy solution to your squirrel problem. It drives them away with sounds they can't stand! This unit is a versatile ultrasonic/sonic squirrel repeller. In some areas, Squirrels are protected by conservation laws. All of our ultrasonic squirrel repellent devices are safe and humane. Ultrasonic sound waves are natural squirrel deterrents and do not cause harm. The squirrel colony will seek a new roost in unprotected structures or natural areas. We've found no other unit that repels as many pests as this one single device. For under $100.00, you won't find better, more effective coverage in any other product. The Transonic Pro Repeller has 5 Different Settings: User-friendly controls let you choose frequency/volume and sound pattern. Ultrasonic for most indoor pests; sonic (audible) for most outdoor pests. Coverage: Up To 3,500 square feet depending on environment.